Iron Gall inks are quite interesting. They are made from Iron Gall Nuts, which come from Oak trees. Here is a quick Wiki on Iron Gall ink. These types of inks were basically the standard prior to the advent of the fountain pen, and even through out the better part of the last century, blue-black inks were often made, at least in part, from iron gall. Straight iron gall ink can be corrosive to fountain pens, so it is only used with dip pens. There are, however, several modern iron gall inks that are quite fountain pen friendly: R&K Scaboisa (purple not blue-black), R&K Salix, Diamine Registrar’s Ink, Mont Blanc Blue Black (bottle form only), and Lamy Blue-Black (bottle form only). Most other modern blue-black inks or going to be your average dye or pigment based ink. You should know that Iron Gall inks are considered high maintenance. You are going to want to flush your pens more often than not and watch for clogs if the ink starts to evaporate some. You also want to be very careful when trying to mix these inks with regular FP inks. There are a few traits that can help you distinguish an iron gall ink from a standard ink. Firstly, it is going to feel dry on the page even if the flow is good. Secondly, it is going to go down a lighter version of itself and darken towards black, grey, or brown over time. Third, it is going to be waterproof when dry. That waterproof aspect is what made me want to try R&K Salix. A lot of my work involves drafting and taking notes for my dissertation. I do all my first drafts by hand. It makes me much more comfortable knowing that my works will survive a spill. There is a story behind this. In short, a couple years ago I had a bottle of water in my bag, and unbeknownst to me the cap had worked its way off. By the time I noticed, water had gotten all over my binder, and I’d lost a semester’s worth of notes. From that point on, I’ve only used bulletproof, eternal, waterproof, and water-resistant inks for my notes. 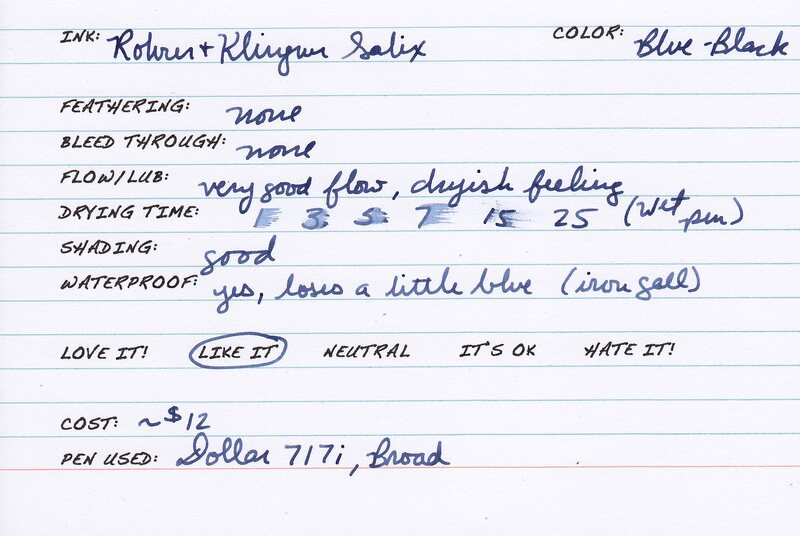 R&K Salix is a bit of a departure from Diamine Registrar’s ink or Mont Blanc Blue-Black in that it stays mostly blue even after the color change. The end result is a nice blue gray not unlike Diamine Prussian Blue. No feathering or bleeding even on cheap copy paper. This is definitely a good choice if you have to use poor quality paper for work or other situations. Good flow, but feels very dry on the page. This ink is still very usable, but it is not lubricating. The drying time for this ink was slow at 25 seconds on this note card and 20 seconds on HP LaserJet 24# paper. This may have been because of the wet writing pen I used, but either way it is slower than you average ink. Lefties take note. Saturation is low to moderate even after the color change. This ink is waterproof. You will lose the slightest bit of blue when wet, but not enough to cause any problems. This sample was sent to me for review by Ryan at Pear Tree Pens. I am not otherwise affiliated with them. Thanks for posting. I’ve been meaning to check these out! I only use bulletproof/eternal/waterproof inks now for exactly the same reason–I really like the Scabiosa color but I’m so reluctant to put it in anything but a Preppy (which is a crappy hard-starter, and I HATE hard-starting pens) because I’m worried about it messing up a better pen.